Sometimes we are fortunate enough to see a rainbow high in the sky when the sun appears after the rain. Rabbi Lord Jonathan Sacks uses such beautiful imagery when he describes this special sign between G-d and human beings! He refers to: “. . . the symbol of the covenant, the rainbow, in which the white light of God is refracted into all the colours of the spectrum.” There were no other humans in sight on a recent lovely, warm summer morning when I went out – just the birds and me! Just the way I like it. 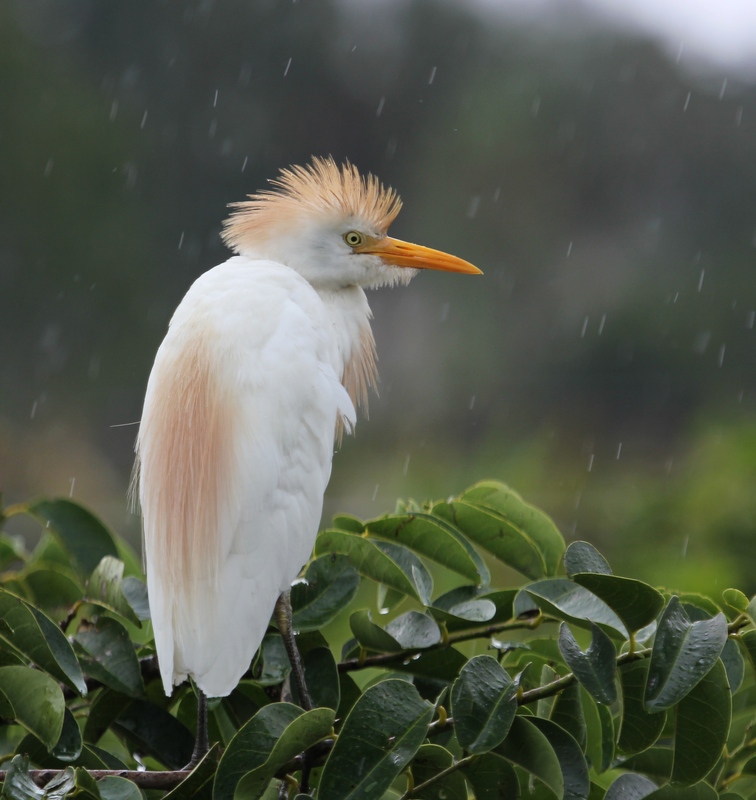 A light, steady rain was falling, and this young Cattle Egret climbed to the top branch, trying to escape the bickering squawks of his tree island neighbors, the juvenile Snowy Egrets. I have always enjoyed watching, listening to, and being out in the rain. It brings back such sweet memories of family camping trips when my children were young – watching them, full of wonder, exploring the woods and streams in their bright yellow slickers. This entry was posted in Birds, Judaism-Birds Connections, Nature and tagged Cattle Egret, Rabbi Lord Jonathan Sacks. Bookmark the permalink.